University of the Sunshine Coast researchers are about to embark on the most ambitious long-term study of the adolescent brain, and they’re calling on 500 local youths to get involved. 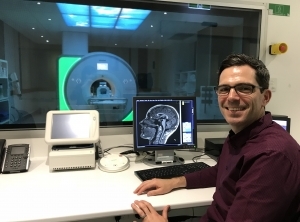 Youth Mental Health and Neurobiology Professor Daniel Hermens is leading the study at the Sunshine Coast Mind and Neuroscience - Thompson Institute, which is currently recruiting 12-year-olds in high school to be assessed several times a year for five years. Professor Hermens said the frequency of assessment for the Longitudinal Adolescent Brain Study (LABS) would be key to successfully gathering data to inform the development of evidence-based youth mental health programs. “The problem with the adolescent data available today is that the annual collection means that we don’t see those subtle changes occurring across the adolescent period when there is such dramatic change in the brain,” he said. “By checking participants every four months, we will be in a position to detect more changes in the brain, data on their social and emotional wellbeing as well as more information about the onset of any problems. Researchers will collect brain imaging, data on cognitive activity in the brain, as well as information on what is happening in their lives, any stresses and influences and, as the cohort matures, expand to their social networks. Topics discussed will include resilience, wellbeing, psychological distress, cyberbullying, body image, nutrition, exercise, sleep, substance abuse and suicidality. The study will be informed by an independent youth steering committee that will suggest questions and approaches. “My hope is that these young people will probably ask the best questions to come out of the study,” Professor Hermens said. Member of the study’s youth steering committee Charlotte Attwater, 14, said young people faced huge amounts of pressure from school, sporting commitments, academic pursuits, peer groups, social media, parental expectations, career decisions, and other areas. “If our brains are changing so much in these years and we are facing so many pressures, it’s surprising that there hasn’t really been a study quite like this before,” Charlotte said. Professor Hermens said the sheer size and nature of the study meant there was much work to be done over five years, but it would result in providing an important missing piece of the mental health puzzle. “It’s surprising how little research has been done on the adolescent brain. Magnetic resonance imaging has been around since the late 1980s but for some reason, adolescence is an age that has been largely overlooked however there is a lot of interest now,” he said. As a side project of LABS, non-identifiable data will be made available to schools as part of a Future Researchers program, which aims to engage young people in the science of the mental health of their own peer group.